Fine needle aspiration consists of using a thin needle and putting the needle into the nodule, wherever the nodule is. 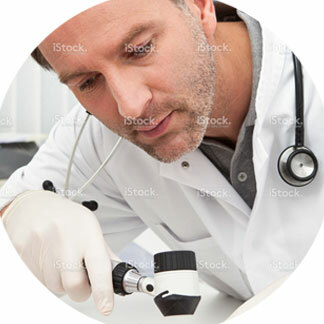 Next the physician will move the needle in different directions within the nodule, obtaining and putting the cells in a smear. The physician will then prepare the smear correctly by spreading the cells in a way that you that can see them on the microscope. The final step of preparation is staining. Once that is done, the physician will observe the cells and determine the origin of the mass and whether it’s benign or malignant. They will then give the patient a diagnosis. I just had to comment on Dr. Idalia Santaella because for the first time in my life I have found a doctor that really understands me and cares about her patients! Every review on this website explains her exactly! She is a wonderful doctor and an eve . . .
What if I Found a Lump? First, you have to be evaluated by a general practitioner and then we can do the aspiration of the mass and determine what you have.